What happens when you don’t drink enough water. There are so many articles out there that show all the positive benefits of drinking water. They’ve been written again and again, and with good reason! It’s important that everyone knows why we should be drinking water! By now, most people know the benefits, but what happens when you don’t drink enough water? Did you know that we can live longer without food then we can without water? A person could survive weeks without food, but only days without water. We don’t have the ability to store extra water, so we need to replenish any that’s lost quickly. It’s suggested that women get about 3 liters and men get about 4 liters, depending on size, activity levels and temperatures. Studies have also suggested that we get about 75% of our liquid intake from beverages, and the remainder from foods. While water is obviously what we should be drinking to replenish lost fluids, foods like lettuce, cucumbers, oranges, and apples also have high water content. If you are eating a diet high is fruits and veggies your liquid intake from foods will be much higher, which is great! Just to put all of this in perspective, if you are drinking 2 liters of water and eating a diet full of fruits and veggies, you are doing good! Each number shown below is a % of body weight loss due to dehydration. Increased thirst, loss of appetite, and general tummy discomfort. You start to feel impatient and your blood volume decreases. You start to feel nauseous and you start feeling sluggish. You have difficulty concentrating and focusing on tasks. Body temperatures increase, as well as your pulse and breathe rate. You will start stumbling and experiencing migraines. Dizziness, shortness of breathe, having a hard time breathing in general. Your body feels weak and you experience mental confusion. Muscle spams occur, and slurred speech. Kidney failure can now happen as well as poor blood circulation. Now think back, have you ever experienced any of these symptoms, and couldn’t explain why? Numbers one to four are pretty common, unfortunately. In our busy lives sometimes we will grab coffee or a soda over water, especially when that mid-afternoon slump hits. 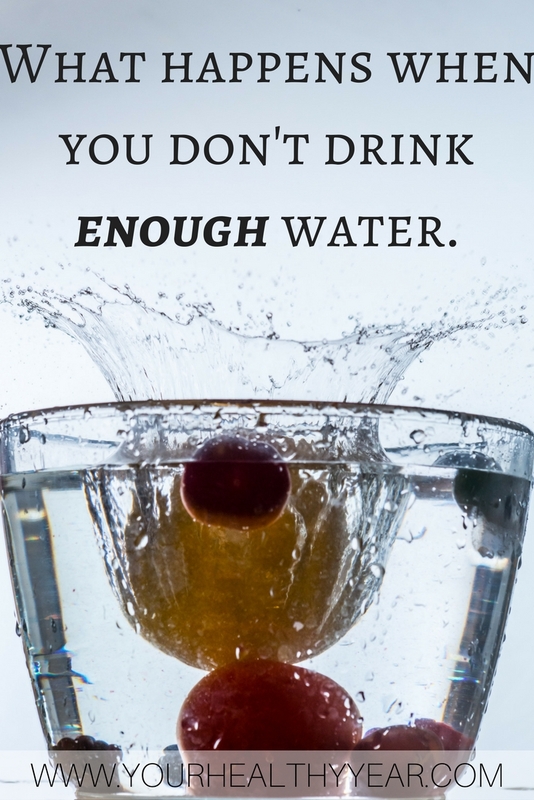 Next time you are feeling tired and drained, reach for a glass or two of water, that just might make a big difference! Another important time to drink water is right when we wake up because we are already dehydrated! Before you pour a cup of coffee, down a glass of water. It’s also important to remember that while coffee and sodas do give some sort of hydration it is not the same as drinking a glass of water. One glass when you wake up. One with your mid-morning snack. One or two with your afternoon snack. One to two glasses before bed. Try and drink them a few hours before you actually go to sleep, so you don’t disrupt your sleep by needing to go to the bathroom! Basically when ever you eat, drink water too! Previous Article← The problem with sugar. I am working on losing 10 pounds of baby weight after giving birth in November. Whenever I feel hungry, I drink a bottle of water first. Usually I am actually thirsty rather than hungry!